A lot of times we hear people talk about injuries and how they sprained their ankle or strained their low back or whatever the case may be. Sprains and strains are both common injuries and both are pretty similar as far as signs and symptoms are concerned; the main difference is that these terms refer to different parts of the body. A sprain occurs when there is injury to ligaments, which are the tough bands of fibrous tissue that connect bones to bones. A strain occurs when there is injury to muscle or tendons (tendons are the tissues that connect muscle to bone). 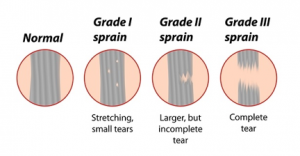 Both strains and sprains can be categorized into 3 groups, Grade 1: 0 to <10% of fibers are damaged, Grade 2: 10-99% of fibers are damaged, and Grade 3: Complete Tear or 100% of fibers damaged. Initial treatment typically includes the acronym, PRICE: Protect, Rest, Ice, Compress, and Elevate. Physical therapy can help aide in the recovery of sprains and strains by addressing muscle weakness, improving flexibility and range of motion, soft tissue work to reduce inflammation, and normalizing joint stability/mobility for safe return to participating activities. If you or someone you know has suffered a sprain or strain, inquire today on how PT can help get you back on track!